“I really don’t know how I’m standing. I don’t mean here, today. I mean – at all. When I was on the other side of Summer’s death, I didn’t think there would be any way for me to function on this side. Yet I am. Why? I can’t explain this any other way, than to say that something sustains me, and it comes from deep inside me. Whatever it is, I feel tethered to it, and it is the foundation of my faith. I’m not suggesting that dealing with the loss of my 16-year-old daughter – one year ago tomorrow – has been easy. Far from it. I have gone through one of the great tragedies life has to offer. The first 6 months after Summer died were so tough. First of all, it was hard just recovering from the stress and trauma of what we all went through while she was ill. What I remember most is the fear. The unrelenting fear that the unthinkable would happen. And then it did. It was so difficult moving from fight mode into the stillness. I remember turning to Charles, my husband, many times during those first few months and saying, “Summer died.” Charles, bless his heart, would just say back, “Yes. she did.” I think I had to hear it out loud, because I just couldn’t comprehend it. A turning point for me came a little after the six-month mark. I was at an all-time low emotionally. I just missed Summer so much, and I couldn’t get it together. I couldn’t be around strangers, and I couldn’t be alone. Then, on the same day, one of my friends took me to lunch, and another friend took me to dinner. And they both asked me the same question: “Have you felt Summer’s presence since she’s been gone?” No one had ever asked me that before. Now here I was being asked that twice on the same day, and these friends did not know each other. I was really quite startled. But could I feel her presence? I’ll get back to that question in a moment, but first I want to tell you about Summer’s journey, because it has everything to do with mine. Over the year Summer battled cancer, I watched, often dumbfounded, as Summer’s sense of empathy, her love for others, grew as fast as the cancer. By the time Summer died, she was a very different girl from the one she had been. To be honest, before Summer got sick, she was a pretty miserable person. For reasons I couldn’t understand, she was sure she had the worst life ever. And self-destructive behaviors were already emerging. At first, the cancer diagnosis just made everything worse. She felt so alone. Cancer removed her from her friends and thrust her into a scary adult world full of pain and fear. I remember her saying, ‘I’m the only one, Mom. I’m the only kid in my whole school with cancer.’ And she was right. It was hard to know how to console her. 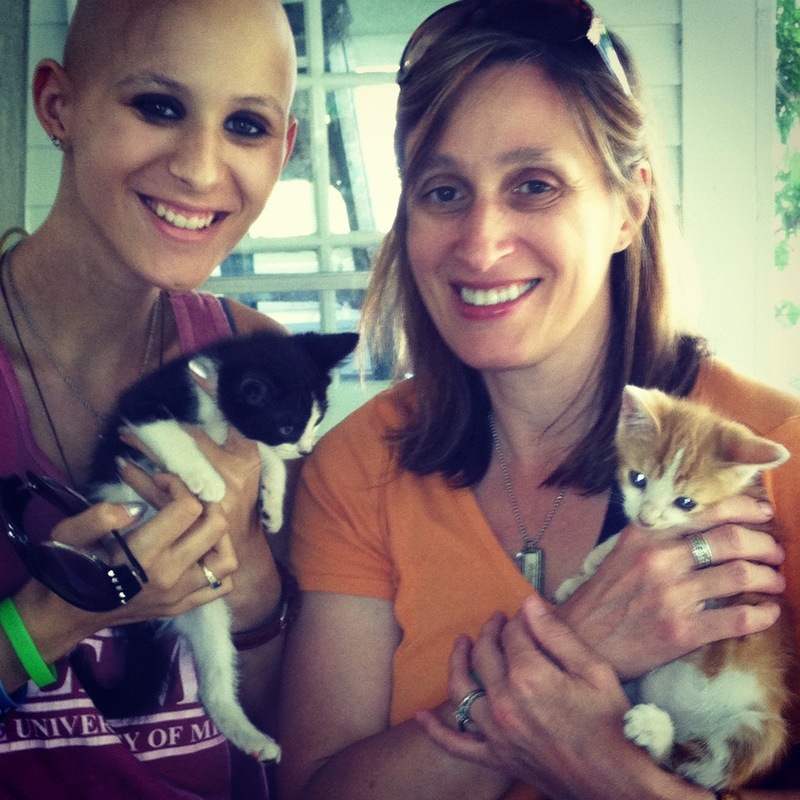 At the same time, she didn’t want to have anything to do with other kids with cancer. When we went into the cancer wing of Scottish Rite, she kept her head down. She didn’t talk to anyone. After her second round of chemo, Summer’s beautiful long dark hair began to fall out in chunks. It was really horrifying. She decided to have it all shaved off to spare herself the sight of her pillow in the morning. As a sign of solidarity, her twin brother, Jordan, shaved his head too. Summer told me later that something profound had happened to her the day of the shaving party. For the first time since she had been diagnosed, she had someone by her side who was going through the same thing she was going through. Family and friends were patting Jordan’s bald head as much as hers. She felt the power of that connection, the connection of shared experience. And somewhere in there, it dawned on her that she really needed other kids with cancer because they were the only people who could really understand what she was going through. About the same time, friends began raising money for our family, selling purple “Team Summer” wristbands. Half the money went to help with Summer’s medical bills, and the other half was supposed to go to the charity of Summer’s choosing. I think most of you know the story by now. By this time, Summer had become acutely aware of all the suffering children around her. Virtually every kid she saw in the hospital or the clinic waiting room had cancer, and it was not lost on her that some of these kids had it so much worse than she did. She began using the money under her charge to buy special gifts for them – gifts that would either cheer the child up or distract the child from the difficult treatments. For example, she gave an 11-year old boy who was facing a leg amputation three enormous Mega Blok kits – a particular passion of his. The night before his surgery, he was building alien spacecrafts, not thinking about what was going to happen in the morning. She gave a 6-year old girl with leukemia a motorized scooter – something the girl had always wanted. Summer wanted her to have fun, the way a child should. She gave iPads and laptops to teenagers so they could stay in touch with their friends when they were in the hospital. The more kids she helped , the happier and calmer Summer got. For the first time, she saw a purpose to her life. Her mission had her glowing from the inside, and everyone around her could feel it. The more gifts she gave, the more people donated to her cause. She got cards and letters from all over the country. Without intending to, she was inspiring people from all walks of life – to do better, to be better people. Before she died, Team Summer had raised more than $50,000. That’s a pretty astounding number for a girl who was also simultaneously undergoing countless rounds of chemo, weeks of radiation, and multiple surgeries. Summer approached her death without fear or self-pity. And she was adamant that even if she were given the choice, she would not trade cancer away to go back to the girl she had been. Her transformation was that important to her. She died at home – surrounded by all her family – on November 11, 2012. Even in her absence, Team Summer is still going strong. Those who had received Team Summer gifts have become the gift-givers. The surprise for us has been that the gift-givers seem to get more out of Team Summer than the gift-getters. We continue to be stunned at the power of unselfish love. Which brings me back to the question my two friends asked me that day, six months after Summer died – had I sensed Summer’s presence since she’d been gone? Believe it or not, my answer came through an experiment I heard about with the Hubble telescope. Scientists decided to focus the telescope on an area of space that was completely black. A space between the stars, devoid of anything. It was a pretty risky move, given the demands on the telescope, and it was quite likely that this experiment would just be a total waste of time. But after ten days of exposure, a breath-taking image emerged. Where there had appeared to be nothing, were actually three thousand galaxies. Three thousand galaxies, containing hundreds of billions of stars. Suddenly, this mind-boggling macrocosm became my microcosm. I thought about the darkness, the emptiness I had been feeling inside of me. I wondered, if I could focus a telescope on it, what would I see? In a flash of insight and understanding, I could suddenly see all the light, all the love inside me, inside all of us. I could feel the hundreds of billions of souls and their connection to each other. And in that flash, I knew that that was what I was tethered to – to the very essence of Life and Love itself. Us. It’s the same loving connection that Summer found so healing. And it’s the same connection that has me on my feet today. And I knew in that instant, yes, of course I could sense Summer’s presence. Of course she was still with me…and with everyone else, too, all at once. Where could she go? May you all feel Summer’s presence – today and every day. The speech you gave yesterday was so touching and wonderful. I have been thinking about Summer all day, I really really wish I met her. We lost our son in August of 2012. We, too, have felt the emptiness and loneliness that comes with tragedy. Know that your words are inspiring, and they brought us comfort. Peace be with you and Summer. Thank you, Lynne. I could hear your voice as a read it. I love you very much. Through Jeri, I knew “of” Summer before her passing. This past year, I know Summer. you helped make such an awesome child. Keeping your family in my prayers today and everyday. You are so special to me! Thank you! Thank you for sharing. I cant imagine your pain. I work at Grace Hospice in Cleveland, Ms. I have seen first hand the loving and loss of family members with Cancer. Your testimony is inspiring. Prayers for continued strength and faith. While I was spreading the word, I opened the link and read this. she has sparked a movement and she has touched me in spirit.